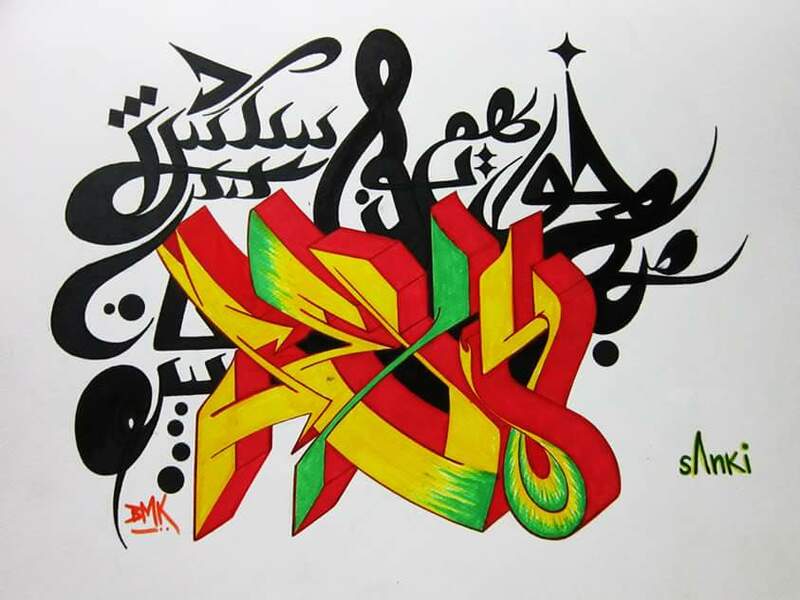 I always wanted to know how Pakistan’s pioneering graffiti artist came to be known as Sanki (or Sanki King). This term is loosely thought to mean anything from mad to crazy, but the artist dispels the notion by saying it equates to ‘deep thinker’. During my recent conversation with him, Abdullah Ahmed Khan explained that when he frequented gaming zones as a teenager and excelled at Counter-Strike, a comment by a friend calling him ‘Sanki’ stuck in his mind, and henceforth became his identity. And my conversation with him did indeed prove that, akin to his name, he thinks deeply about life. In Pakistan, one can see wall-chalking, scribbles and marks on walls either in the form of advertisements, political slogans, names of underground groups or the general public voicing their opinions. However, while those expressions may appear unsightly or overtly commercial, what is remarkable is how Sanki takes them to another level, where he combines them with artistic ability that enables them to be deemed art. Bold, loud colours with rough scribbles shape out messages of peace and hope. A wall exudes patriotism as it reads out “I Love Pakistan” (a project that took him 4-5 days to complete amidst intense traffic), while a hummingbird painted on large scale extracts nectar from a flower on another wall. Sanki has also painted a bus with the message ‘Love Karachi’ written on it. What is interesting is how interdisciplinary Sanki is. 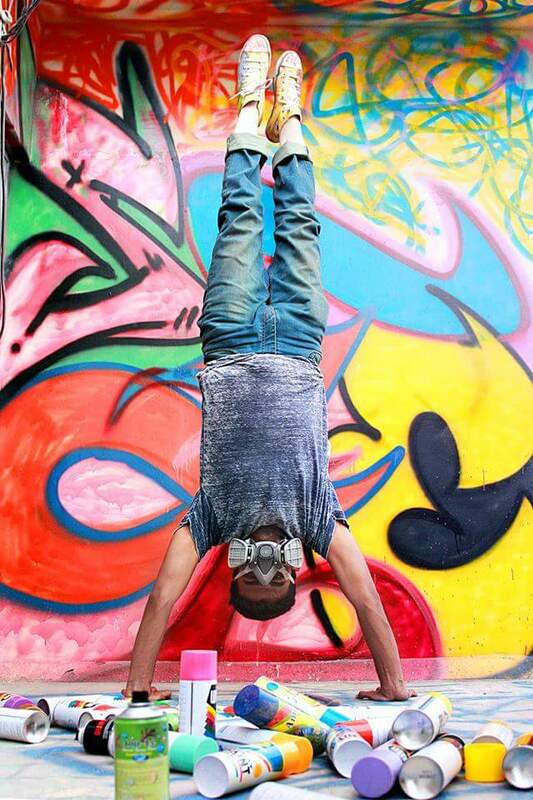 While being foremost a graffiti/street artist, he has (unknowingly) been interested and proficient in hip-hop and all that it entails since the age of ten: rap, beat-boxing, parkour, b-boying, DJing and much more. 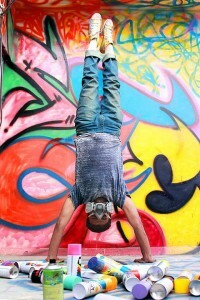 After being noticed and photographed by Tapu Javeri while freerunning in a park in Karachi in 2008, Sanki and his friends performed at an event for Style 360. After that, there was no looking back. But how did he get into art in the first place? Completely untrained, Sanki did art in his free time to kill boredom. Since his mother passed away when he was only eight, art was what kept him busy and became his friend. It was drawings that interested him in biology class and occupied him during school breaks. And while family has been very supportive, his experience and knowledge came from his own research as well as practising on his friends’ walls. 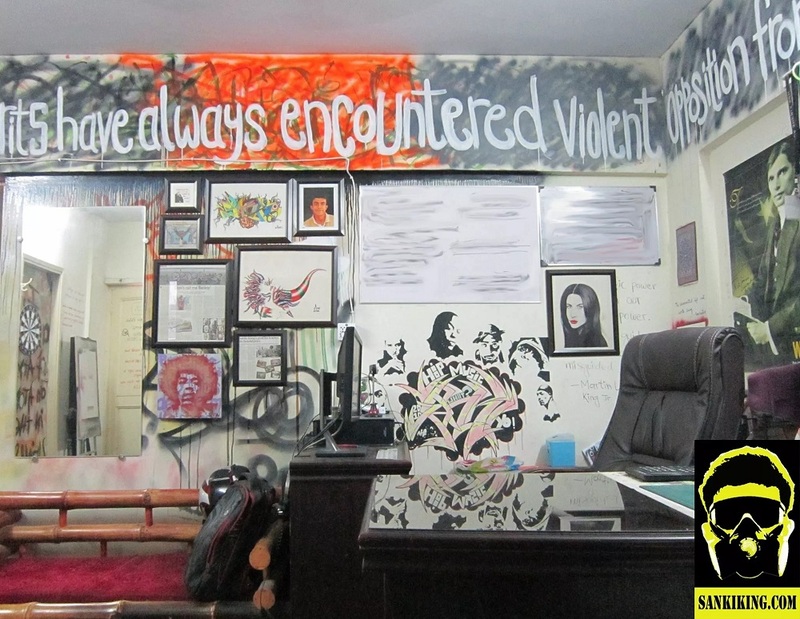 Social media played its part by enabling him to create various pages of interest and connecting with other graffiti enthusiasts across Pakistan, and of course, the world. It is this very social media that has helped Sanki showcase his talents worldwide and receive global recognition. In 2012, he designed a mix-tape CD cover for an artist in California. In exchange, instead of money, Sanki asked the artist to send him two books: one on the well-known street artist Shepard Fairey, and the other by Nicolas Ganz, called Graffiti World: Street Art from Five Continents. After an email exchange with Ganz where he shared his work, Sanki received an unexpected reply; he was invited to feature his work in Ganz’s latest book, Street Messages. This book, now published, contains the work of 80-85 artists from all over the world, including the famed, albeit notorious, Banksy. Sanki is not short of achievements. He has been invited to judge national graffiti competitions, lecture on graffiti art, and has recently introduced his work to a fashion brand, Arsalan Iqbal. When asked how it happened, Sanki mentioned that he had been hired to paint the brand’s shutter in Zamzama in 2012. For his new collection, Arsalan Iqbal was inspired by graffiti art, and what better artist to work with in Pakistan than Sanki? He thus contacted Sanki two years later and collaborated with him for his new collection, where Sanki provided the designs that the designer morphed into trendy denim outfits. 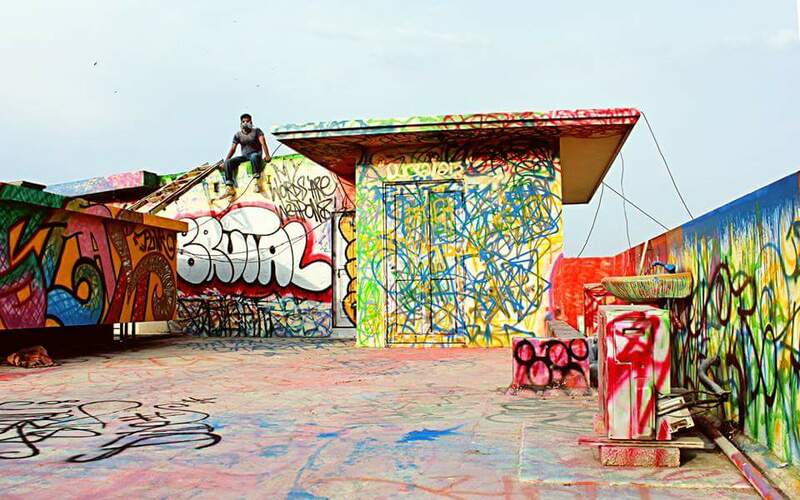 Quoting this as his most ambitious project, which took close to a year, Sanki stated that he also painted the entire rooftop where the collection was photographed for a prominent magazine. What’s more, the collection was showcased at the PFDC this year. Sanki is also Pakistan’s foremost sneaker artist and sticker artist, and his clever designs and witty taglines make his work very popular. He has also been interviewed by one of the biggest sneaker conventions in the world, Sneakerness. 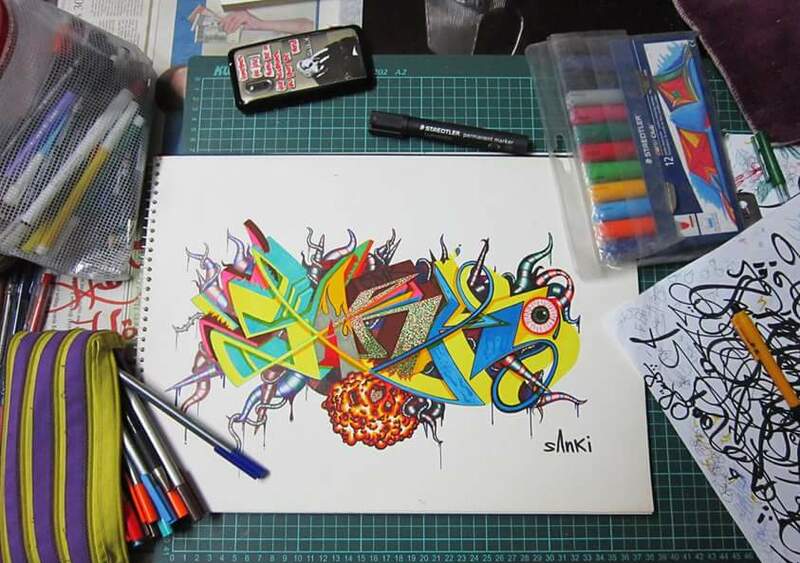 Sanki’s work shifts from commercial projects to his own artistic expression. He has had a personal home-based studio since early 2012. However, commission-based projects currently take up most of his time, leaving very little for his own leisurely art practise. One might wonder, though, is graffiti merely a means to an end for Sanki, or is he saying something particular with his work? During our conversation, Sanki mentioned that what is important to him is for people to understand his journey; while our lives are influenced by what others think of us, he emphasises working hard, being fearless, persevering and emerging as a victor from hard times. He says: “You do not need expensive things or an art education to be an artist; art is inside you”. Shanzay Subzwari is an artist and art writer based in Karachi. She tweets @shanzaysubzwari. The cup that cheers is a complication if it affects any suggest of your human being, levitra coupon including your form, your wield and your individual at home. You may comprise a complication with levitra if you think nearly drinking all the all together, canadian pharmacies if you keep to worrying to forsake on your own but can’t, or if you often liquid refreshment more than you blueprint to or more than is secure in search what you are doing [url=http://onlinepharmacy.top/]canadian pharmacy[/url] (such as driving a railway carriage). сиалис 5 мг как долго можно принимать Довольно часто левитру принимают и для профилактики сексуальных расстройств. Такой сыворотки для кожи до сего момента не было в мире! Lamiderm apex, a brand new exclusive skin care formula, apex goes beyond the skin’s surface to repair,apex goes beyond the skin’s surface to repair, rejuvenate and restore at the core of the problem. I’m really enjoying the theme/design of your site. Do you ever run into any internet browser compatibility issues? A couple of my blog readers have complained about my blog not working correctly in Explorer but looks great in Firefox. totally, except this article offers fastidious understanding yet.